Our Club: The Troy Community Lions Club is a newly chartered volunteer organization dedicated to leadership development through community service. Our aim is to support the needs of Troy and surrounding communities through volunteerism and fellowship. We are part of Lions Clubs International, which is an international network of 1.3 million men and women in 202 countries. Throughout the Lions Clubs of Michigan, there are more than 14,500 members in approximately 500 clubs. Troy Community Lions is a club for both men and women. We participate in service, civic, and social activities. We are looking for active volunteers who would like to have a positive impact in the community. Plan on attending a meeting and see how you can get involved in helping others. Come see what being a Lion is all about! 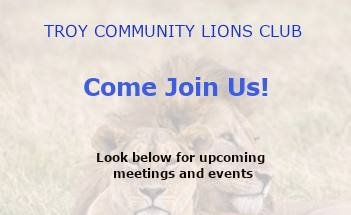 Check our calendar and attend the next meeting of the Troy Community Lions. You are always welcome!